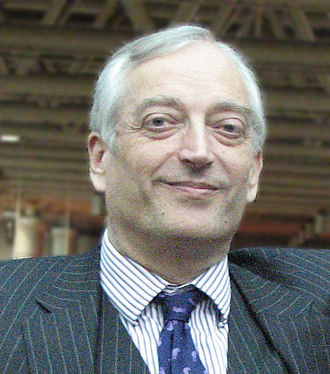 Christopher Monckton has issued a call to defund all the weather bureaux. He wants us all to stop monitoring weather and climate. The headline of his latest article on Anthony Watts climate conspiracy blog (archived here, latest here) is: "Time to defund the weather-forecasting rent-seekers". What upset Christopher this time was a climate statement issued by the Royal Meteorological Society and endorsed by 33 organisations around the world. He doesn't like to be reminded that global warming is real and happening. Christopher's answer to his cognitive dissonance is to stop funding weather agencies. He'd rather not know if the sun will shine or the rain will pour tomorrow, than have to read that global warming is real and dangerous and caused by us. Much of Christopher's article was about how 97% of scientific papers that attribute a cause to warming, attribute it to human activity. He made much of the fact that it was "only" 64 of the abstracts looked at in Cook13, which quantified this. Christopher didn't mention the number that attributed most of the cause to human activity (3,896 out of 4014 or 97%). He was only concerned about the number that put a number on it. What Christopher Monckton didn't do, and I've yet to see any disinformer or denier do, was look at the papers that quantified rejection of anthropogenic global warming. This is odd, because there are only nine of them, out of 11,944 abstracts that were looked at in Cook13. It's not a big job so I've done it for him. First of all, as I said, there were only nine papers out of 11,994 abstracts examined by the Cook13 authors, which explicitly rejected the fact that humans are causing global warming, and quantified it. Four of these nine involved the same author, though even these did not necessarily attribute the warming to the same cause each time. In one of the nine papers the silly author even tried to claim that it's not been warming. He's wrong. It is warming and it's caused by Jupiter and Saturn. It is warming, but it's the sun, or it might be. It is warming but it's the sun, or it might be ocean outgassing, or it might be microbes. Below are links to the nine papers in which the authors reject reality. They are all very unscientific and foolish. None was published in a quality journal. First there's the denier duo of Sallie Baliunas and Robert Jastrow, who argue that it might be the sun that's causing global warming. That's despite the fact that there's not been any increase in solar radiation while the earth has warmed a huge amount. Next there are four papers involving arch denier Leonid Khilyuk. He can't make up his mind if it's just the sun, despite there being no increase in solar radiation. So in one of them he added in outgassing, even though the oceans are absorbing more CO2, not less, each year. For good measure he tried out "microbes" - as if there's been a sudden rush of microbes in the past few decades. In two papers he tries on the claim that CO2 cools the earth, though I can't see how that works when the earth is heating while CO2 is rising. Khilyuk, Leonid. "Global warming: are we confusing cause and effect?." Energy Sources 25, no. 4 (2003): 357-370. (pdf) - It's the sun. Khilyuk, L. F., and G. V. Chilingar. "On global forces of nature driving the Earth’s climate. Are humans involved?." Environmental Geology 50, no. 6 (2006): 899-910. (pdf) - It's the sun, and maybe outgassing, and microbes. Chilingar, G. V., L. F. Khilyuk, and O. G. Sorokhtin. "Cooling of atmosphere due to CO2 emission." Energy Sources, Part A: Recovery, Utilization, and Environmental Effects 30, no. 1 (2007): 1-9. (pdf) - CO2 cools the earth. Chilingar, G. V., O. G. Sorokhtin, L. Khilyuk, and M. V. Gorfunkel. "Greenhouse gases and greenhouse effect." Environmental geology 58, no. 6 (2009): 1207-1213. (pdf) - CO2 cools the Earth, CH4 has no effect. Robert Essenhigh is an engineer not a climate scientist. It didn't stop him from getting a so-called climate paper published in some energy journal. He tried on the silly claim that despite all the evidence, CO2 isn't a long-lived gas in the atmosphere. CO2 goes in and out of the atmosphere. Simplistically, as a molecule goes into the ocean it's replaced by another that comes out. Robert confused the average time a single molecule of CO2 stays in the air before it's swapped with one from the surface, with the time taken to reduce the total amount of CO2 in the air if it's out of whack (like it is now). The former time is about five years, the latter is much, much longer. 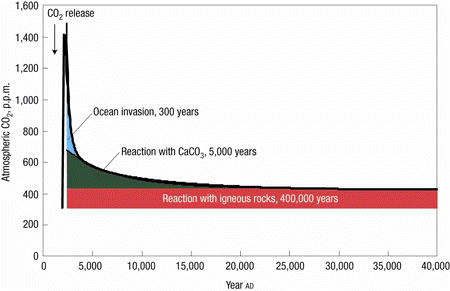 The chart below shows just how long it would take for the different carbon cycles (fast, slow and very slow) to remove CO2 from the air if there was a sudden single big pulse lifting atmospheric CO2 from around 250 ppm to 1500 ppm or so but then no more was added. The slowest process involves reaction with igneous rocks and for all practical purposes (as far as we humans are concerned), takes forever. If you want more, there's an easy article in Nature Climate Change, and a more detailed analysis in Annual Reviews. I don't know how Robert Essenhigh accounts for the 44% increase in atmospheric CO2 - surely most of it should have dropped out by now if he was correct (which he's not). Essenhigh, Robert H. "Potential dependence of global warming on the residence time (RT) in the atmosphere of anthropogenically sourced carbon dioxide." Energy & Fuels 23, no. 5 (2009): 2773-2784. (abstract only) - CO2 isn't long-lived in the air. Some unknown called A.S. Sarkisyan tried to argue that it's not warming. Sheesh. How deep in denial must one be to argue that? Sarkisyan, A. S. "On some achievements and major problems in mathematical modeling of climatic characteristics of the Ocean (critical analysis)." Izvestiya Atmospheric and Oceanic Physics 46, no. 6 (2010): 668-676. (abstract only) - It's not warming. The pattern watcher Nicola Scafetta decided that it's Jupiter and Saturn that cause climate change on Earth. He'll have a hard time convincing anyone of that. Scafetta, Nicola. "Empirical evidence for a celestial origin of the climate oscillations and its implications." Journal of Atmospheric and Solar-Terrestrial Physics 72, no. 13 (2010): 951-970. (pdf) - It's Jupiter and Saturn. Last and least is Xiaobing Zhao, who claims that the greenhouse effect isn't real. Like other deniers he doesn't explain how our planet isn't an iceblock. Zhao, Xiaobing. "Is global warming mainly due to anthropogenic greenhouse gas emissions?." Energy Sources, Part A: Recovery, Utilization, and Environmental Effects 33, no. 21 (2011): 1985-1992. - It's not CO2. Now given all these choices available to Christopher Monckton, which one does he favour? It turns out that he doesn't favour any of the above silliness. He knows that CO2 is a greenhouse gas and that it's causing global warming. He just doesn't want anyone to know how much it's warming and how dangerous it is, so much so that he fudges data and misrepresents the science. 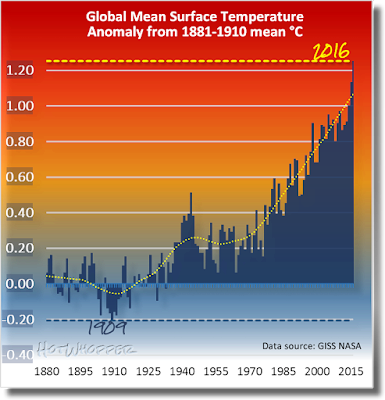 Nick Stokes pointed out one of Christopher's tricks of fudging a chart of global temperature and making a false claim about model projections. The usual tiresome trick of plotting a prediction against some rearranged data which was definitely not what they were predicting. They were predicting surface temperature. Disinformers and climate science deniers are well-known for their inconsistency. The correct response of the Trump administration to their latest intervention in politics would be to defund them altogether and make them live by the accuracy of their forecasts. On that basis, IPCC is doomed. First, the statement he's complaining about was only endorsed by one meteorological agency as far as I can tell, the European Centre for Medium-Range Weather Forecasts. Most of the rest were professional associations and societies, not weather bureaux or climate science agencies. Another point is that most of them aren't in the USA, and I doubt any of them get funding from the US government. Finally, even if Trump could "defund" them, and even if they were making forecasts, how would they make forecasts if they don't exist any more? The people at WUWT are a laugh a minute. Forest Gardener went at Nick Stokes hammer and nail, and was unable to understand the very straightforward answers, despite multiple help in all different ways. Deniers are really dumb. Another one was Pop Piasa, who thinks the experts at the World Bank would waste time paying attention to the dumb notions of a potty peer. It would be ideal if the World Bank would give consideration to Lord Monckton’s calculations of climate mitigation vs. adaptation. Bill D picked up on Christopher's misuse of the word "collectivists", which he took from the title of the statement from the professional societies. A splendid incision by LMofBr: he cuts them to ribbons. Joel O'Bryan remains hopeful that removing science funding will be all it takes to stop global warming in its tracks. What a nutter. I bet he thinks that if he stops fire brigade funding there'll be no more fires. The UNFCCC and theIPCC need to die. A quick painless death by removal of funding. The end of the CO2 climate hustle is nigh. Top photo of Christopher Monckton from Wikipedia. "Next there are four papers involving arch denier Leonid Khilyuk"
Would that be the same guy who also writes stuff such as Probability in Petroleum and Environmental Engineering. I wonder what the connection with climate science is. It was a bit painful but funny watching Forest Gardener. I originally thought it was a double posting. Nick Stokes is remarkably patient. What good is a zombie that won't keep coming back to life? What's the point of using forecasts from 1990? They were described as uncertain at the time, and have been out of date for over 20 years.